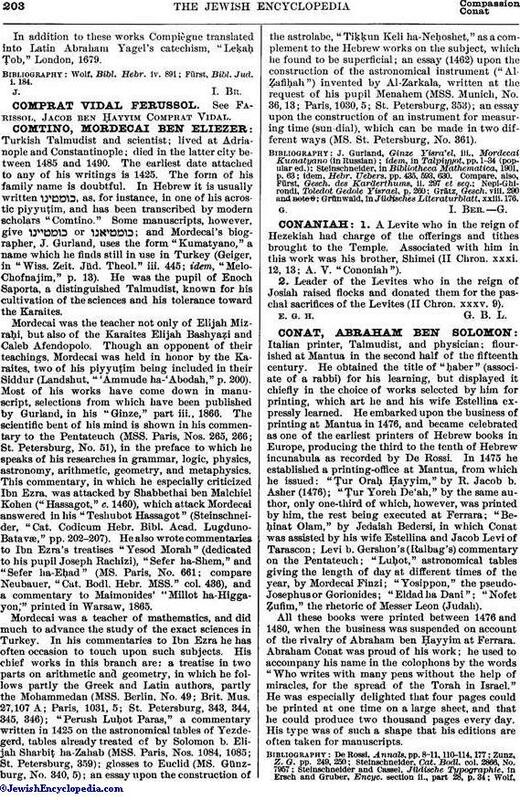 Turkish Talmudist and scientist; lived at Adrianople and Constantinople; died in the latter city between 1485 and 1490. The earliest date attached to any of his writings is 1425. The form of his family name is doubtful. In Hebrew it is usually written , as, for instance, in one of his acrostic piyyuṭim, and has been transcribed by modern scholars "Comtino." Some manuscripts, however, give or ; and Mordecai's biographer, J. Gurland, uses the form "Kumatyano," a name which he finds still in use in Turkey (Geiger, in "Wiss. Zeit. Jüd. Theol." iii. 445; idem, "Melo-Chofnajim," p. 13). He was the pupil of Enoch Saporta, a distinguished Talmudist, known for his cultivation of the sciences and his tolerance toward the Karaites.